It often so happens that a designer arrives at a computer model in Rhinoceros, Grasshopper, Maya, etc. that he or she is happy with and ready to fabricate. It is at this point where many decisions are made as the designer is forced to finally decide how to make, or construct really, the model in reality. Several things are taken into account in these decisions, but a knowledge of conceptual strategies for constructing digital projects can be useful to realize design intent and match projects best with their most compatible fabrication strategy. It is important to be familiar with these strategies in order for your project to materialize. Being aware of the strategies before starting your project will facilitate production and make fabrication run more smoothly. As we know, the majority of the time, we are putting planar materials into the CNC machine in order to achieve specific geometry. There are material operations that the CNC machine is very good at, and mastering the technique and logic of the strategies outlined next will only facilitate using the machine. “Contouring” is the most subtractive process in that it literally removes material by carving in order to reshape the surface into a “three-dimensional relief.” Of all the techniques discussed in this chapter, contouring has had the least success in its application to building full-scale. The carving process of contouring produces a high amount of waste, and if the contouring is intensive, is very time-intensive for the machines. The general limits of contouring have to do with size and practicality. Contouring is also somewhat limited to the use of softer materials such as foams, wood, and soft metals. The greatest benefit to come of contouring is its role in the “forming” technique, when a mold is shaped using contouring through a CNC machine or another digital process. “Folding” is one of the most useful techniques and is great for digital fabrication projects. A fold introduces stiffness and structure to a plane as well as three-dimensionality. It is extremely useful in digital fabrication because it is a direct way of converting 2-D planes to three-dimensional shapes. Laser cutters are better for folding projects than CNC millers, but both can be used. “Forming” presents one of the most ubiquitous techniques for digital fabrication and the construction industry, as well as many manufacturing industries, and it has been for a long time. Everything from hardware to pre-cast concrete panels employs forming as the main technique of production. Although forming has been used in a repetitive way historically, digital fabrication processes have revitalized this, creating a way to make infinitely customizable formwork. Even when used repetitively, the possibilities for the parent formwork are far greater than in the past. “Tessellating” is also a very useful technique as it converts a curvilinear surface into fragments that are two-dimensional. A technique that is as old as mosaics, “tessellating” has helped humans for thousands of years break down hard-to-define surfaces into understandable 2-D parts. These are just some basic strategies and guidelines for digital fabrication. The true breadth of even just these techniques is difficult to describe, but there are other strategies as well. These strategies are often combined to produce even more complex and sophisticated results. There are more strict “kit-of-parts” projects as well, which employ more of an Erector Set or Lego logic for its construction ethic. Thinking of your project as a “top-down” or “bottom-up” approach to building will help as well. Are you trying to construct one big piece already modeled and decided upon (top down)? Or are you building from a kit of pieces (bottom-up)? Is your strategy additive or subtractive? Are you realizing a designed whole? Or is your project an assembly of units with no formal intent? This is an impressive installation in the North Caroline Museum of Natural Sciences. It is composed of 3600 LCD glass tiles and runs on less power than a labtop computer. 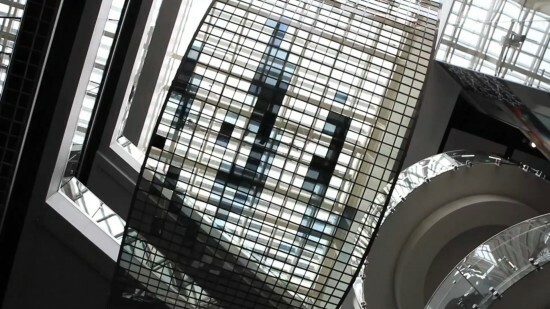 An amazing piece of art, the LCD glass changes transparency frequently, giving the visual effects that it does. The tiles are programmed and cycle through 20 programs such as chirping birds flying over, running water, and moving grass. The LCD tiles were assembled in 18 panels, each one is 5′ x 10′ and contains 200 LCD tiles. The tiles are held in by laser-cut steel, and then the whole things was attached to an aluminum frame of C-channels. I thought this project was relevant because, although it is not a wall project, it is an installation in a space that deals a lot with sound. Beyond this, I thought the tiles were a cool new material, and I didn’t know they could be used that way. The designers describe the installation as an “LCD Ribbon,” but the sound quality of the soundtrack makes the installation so much more than just it’s visual static appearance. Indeed seeing it in action in the video brings it to life.